Cocooned in lush gardens that open out onto lovely Avlaki beach, Bella Mare has claimed one of the most desirable spots in this exclusive corner of north east Corfu. The sublime location, spectacular views and exceptional service – all the hallmarks of a Simpson Hotel – create the perfect atmosphere for relaxation, with numerous delightful places to sit and soak up the sun amongst the wonderfully tranquil grounds. There is a generous pool and if you are feeling a little more energetic, Simpson Watersports, our exciting new partnership with the Corfu Sailing Centre, is a short stroll along the beach offering lessons and equipment hire. 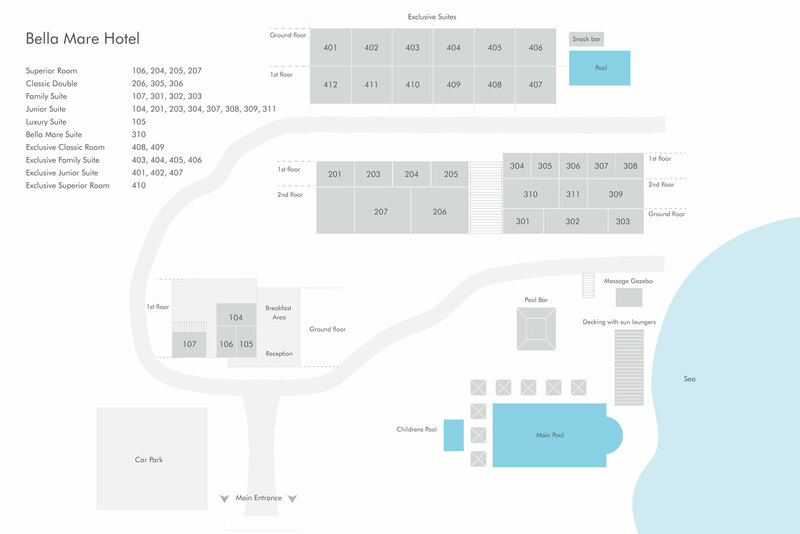 Whether you’ve been out on the water or taking it easy on a sunbed, the poolside bar is the perfect place for a lazy lunch, with a tempting choice of drinks, light meals and snacks offered throughout the day. And in the evening, enjoy a cocktail and gaze out across the bay as the distant mountains of Albania set to a glorious salmon pink. All rooms at Bella Mare have spacious, elegant interiors, sea views and their own kitchenette and fridge should you wish to dine in. And for a little extra luxury, our ten Bella Mare Exclusive Suites, new for 2019, share an additional private pool and daytime bar. For evening dining, there are two excellent tavernas moments from the hotel – or the vibrant village of Kassiopi, with its pretty shops, waterfront restaurants and low-key nightlife is a pleasant 20-minute walk or a five-minute drive. Bella Mare makes an excellent choice for families too, with the introduction of our Dolphins club for 7 to 10 year olds and Tribe for older children and those hard-to-please teens. Based at the hotel, the clubs run from 14 July to 31 August and offer a flexible and inspiring programme for our younger guests ensuring a restful, restorative and truly memorable holiday for everyone. New for 2019 – ten state-of-the-art luxury suites with a contemporary feel. 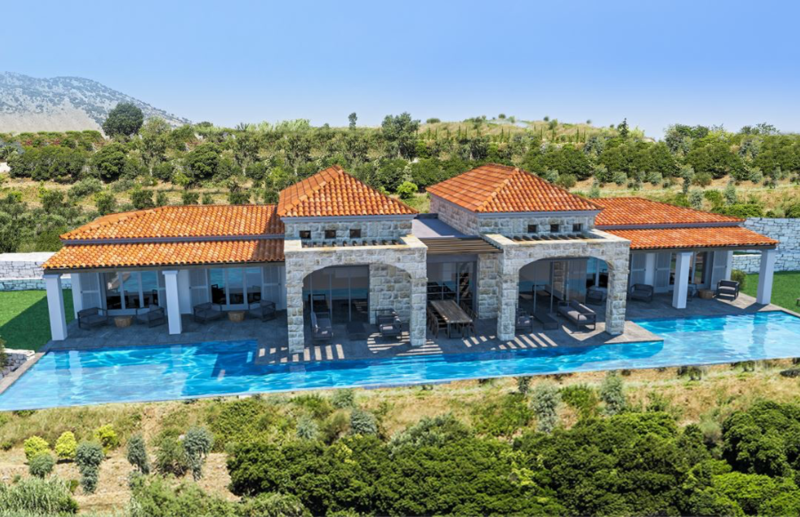 New for 2019 – A stunning 7-bedroom Simpson Exclusive villa overlooking Avlaki Bay. Try your hand at kayaking, windsurfing, SUPs and sailing through our exciting new partnership with the Corfu Sailing Centre. A six-day programme of fun-filled activities and adventures for 7 to 10 year olds. Our new club offers older children and teenagers a chance to socialise, flex their independence and learn a few new skills along the way. In Greece, a nominal visitor tax applies, known as the Overnight Stay Tax, which varies depending on the accommodation. During your stay at the Bella Mare Hotel, €1.50 per night per room must be paid locally in cash and will be collected either by the property owner or our local representative on their behalf. If you would like car hire outside of these dates, please call for prices. * All our cars include comprehensive insurance with zero excess. For this particular destination, the undercarriage tyres and windscreen are not included in the cover. An excellent hotel in a quiet and beautiful location. The staff are friendly and the accommodation is comfortable. Our Junior Suite was spacious and the balcony overlooking the grounds and the sea was a real bonus. Watching the sunrise was glorious. We had a wonderful holiday experience from beginning to end. Bella Mare is a lovely small hotel, fantastically located with great customer service...and nearby to some fabulous small bays and tavernas...really couldn’t fault it. Thank you. This was the second time we have used Simpson Travel and will certainly use the company again if possible. All the staff we had contact with were superb. I love Simpson Travel – you consistently get excellent service. The quality of the décor and rooms is always good and stylish, and the staff, both in the UK and abroad are always welcoming and helpful. I rarely look at any other travel companies for a holiday in Europe as I know Simpson Travel will be just to my liking. It's a company you can trust. Our choice of Greek properties is as diverse as the islands themselves, ranging from simple seaside charm to genuine luxury and style. Much of our portfolio is privately owned, and price alone is therefore not a universal guide. We contract all our accommodation in person, and each property has its individual appeal. A hundred stories unfold on lovely Corfu… Tales of gods and goddesses, Phoenicians and Venetians, vibrant towns and sleepy villages. There’s also a rich natural history of mountains, olive groves, fertile valleys and a coastline dotted with picturesque coves, sandy beaches and rocky inlets. Follow in the footsteps of Lawrence and Gerald Durrell with a luxurious retreat to Corfu’s North East, near Agios Stephanos, or venture North West, to enjoy more sandy beaches and scenic coastal drives. To help you make the most of your luxury holiday in Corfu, our collection includes luxury villas and a charming waterfront hotel on Avlaki beach. For 2019 we’re delighted to introduce Dolphins and Tribe clubs and activities for 8 to 18 year-olds during summer school holidays. We're also launching the brand-new Simpson Watersports, with equipment hire and lessons with expert instructors.